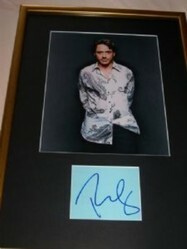 This is a 8x10 inch portrait Photo of Robert Downey Jr with accompanying Autograph. The autograph was obtained in person at the premiere of his film Tropic Thunder at the Odeon Cinema Leicester Square, West End London on the 16th September 2008. The above have been recently mounted behind glass in a 12x18 inch wooden frame.